If you’ve been following me on Instagram or my blog, you might know I’m almost halfway through my year goal of creating one original quilt pattern and quilt each month. 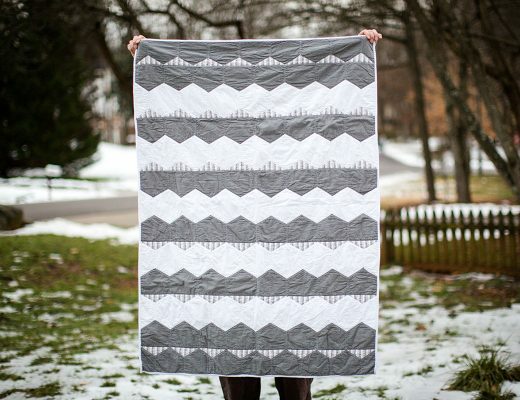 One of my recent quilt finishes (let’s call this the “May” quilt) is up there on my list of favorites – a geometric quilt. 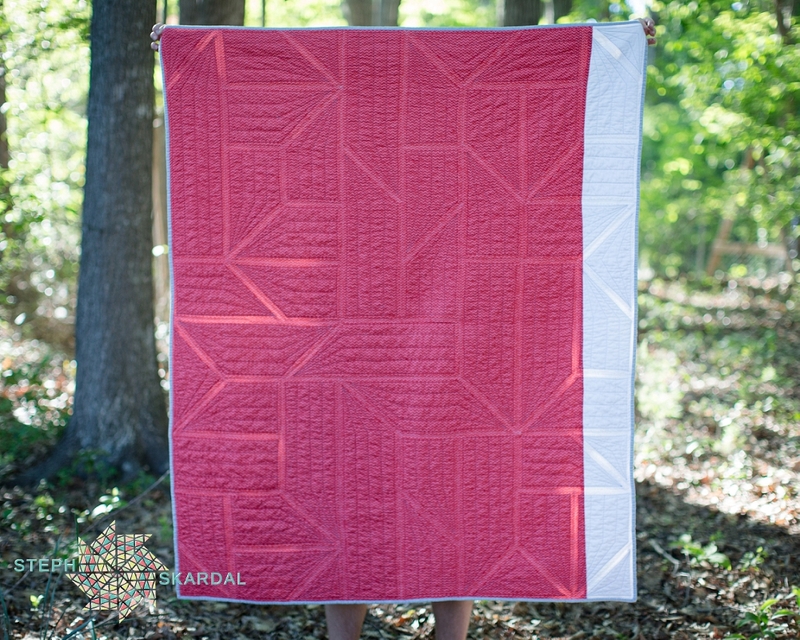 I wanted to share a quick blog post with details on my inspiration and official photos of the quilt, so here it is! I’m inspired by geometric textiles. For this particular quilt, I came across a geometric wall paper that I liked. From there, I sketched a design (with pencil and paper!) and played around with angles and shapes. I deviated quite a bit from the original repeating geometric wall paper I found, because I wanted something that was not repeating. After I had a sketch that I liked, I brought the design into Photoshop to start playing around with border sizes. Bringing into Photoshop allows me to play around with the proportions a bit before I started sewing. Once I had a completed Photoshop design, I studied it to determine the dimensions of the various pieces I needed to cut. I cut and sewed only a few sections (about 1/8th of the finished quilt) as a proof-of-concept to make sure my measurements were right. From there, I kept adding on sections of the quilt, although I had to take a break when I ran out of fabric! While the quilt is made up of mostly similar shapes, there were a few oddball shapes, and I had the trickiest time figuring out seam allowances for them. For all shapes, I cut the solid shape out and then added a 1 inch border in the white around it. 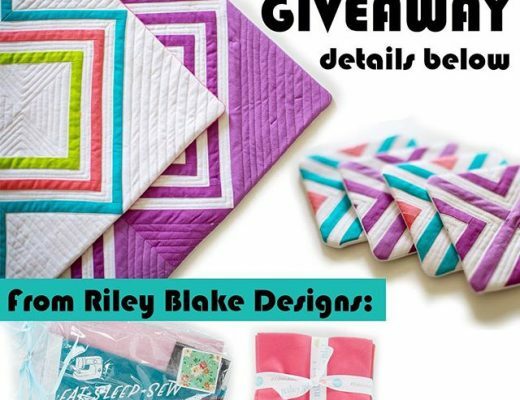 With a 1/4″ seam allowance, the final size of the border around each shape was 1/2″. I wanted to go with minimal color variation on the front since the geometric design is quite striking, so I chose Robert Kaufman Essex yarn dyed linen in Indigo paired with Kona Cotton in white. I’ve stuck with Aurifil (wt 50) since I tried it out a few months ago and have been quite happy with it. The batting is Warm and Natural cotton, the binding is Essex linen in Dusty blue, and the back is Heather Bailey Momentum voile with a strip of Kona cotton. 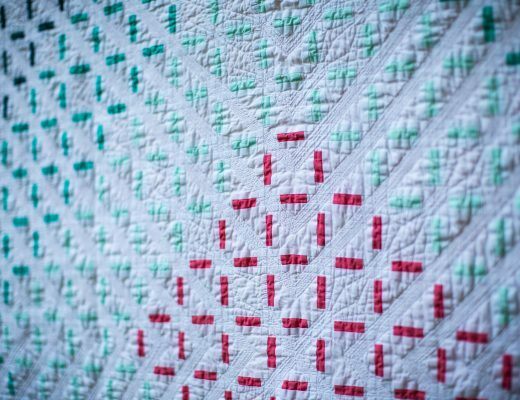 The quilting itself was a combination of stitch-the-ditch and straight line quilting along the geometric shapes. Overall, I’m quite pleased with the quilt and design, although there were a few spots along the border where my measurements were slightly off resulting in wonky edges. Also, while I love this quilt, I’d like to attempt this design with at least one more color added for variation. And if you were following me on Instagram, below is a compilation of all the in-progress photos I posted during this project. Enjoy!